The Classy Montreal shop exuded an air of sophistication as I made my way past the suited mannequins to meet with president of Classy Formal Wear, Mr. Antonio Marchetti and account director Sabrina Marchetti. They welcomed me to the sunlit backdrop of men’s attire to discuss the latest trends in suits and formalwear as well as the interesting history which brought the Classy brand back to the forefront of men’s attire. The Classy name has been around for decades. Mr. Marchetti, then a salesman, worked at the first Classy store in 1973. “It was an empire,” he tells me as he recalls the landmark shop in the heart of downtown Montreal. He talks about the pride he takes in his work and in serving the industry which has been a part of his life for 42 years. Although the business faced some turbulent times Mr. Marchetti, now president of Classy Formal Wear, remained steadfast in his determination to bring “The Classy Man” back. He and his daughter are passionate, knowledgeable, and dedicated to translating that energy to their clients. “I wanted to resuscitate it,” he says about a business that is so dear to his heart. Looking around, the walls were lined with inspiration for the debonair man. A variety of styles and shades of suits and tuxedos were exhibited on either side of the showroom. To the right, tall windows brought the sunshine in. Next to the fitting rooms, comfortable chairs and sofas defined the area where customers try on their suits and discuss possibilities. I pause to gaze at a young man trying on a blue suit. “I have served their fathers,” Mr. Marchetti says nostalgically. His unique savoir-faire and Sabrina’s modern approach to the classics allows clients to experience the best of both worlds. They can select from a wide range of the latest designer collections in suits and tuxedos to buy or rent. 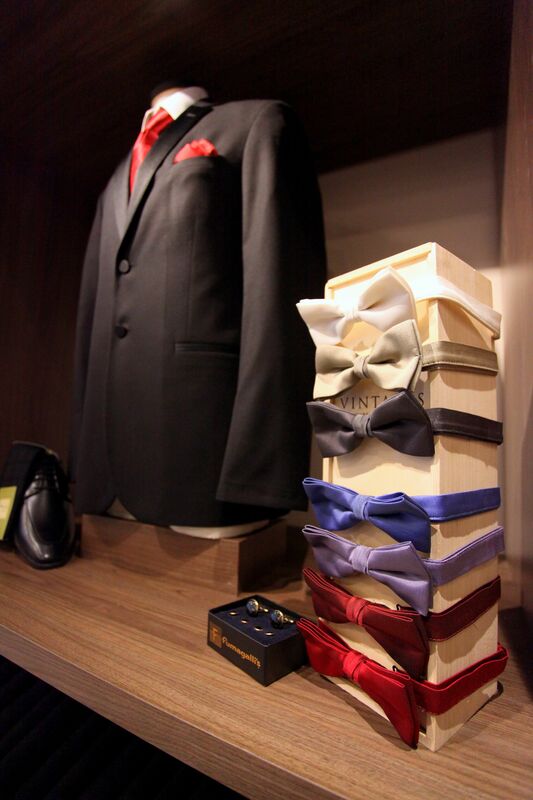 And, for the finishing touch, they choose stylish accessories such as bow-ties and ascots, formal vests and shoes. Whether a man is looking for the right cufflinks to complete his look or for contrasting suspenders to bring out his trendy side, he can find it all in one location. With a staff that is qualified and knowledgeable, with 20 years of experience each, they know their field very well. They are proficient and professional and always there to guide you to make the best choice that suits your needs.